Directed by Alexandre Bustillo & Julien Maury. Starring Finn Jones, Lili Taylor, Nicole Andrews, Stephen Dorff, James Bloor, Vanessa Grasse, Sam Coleman, and Sam Strike. While it might not be easy to have sterling expectations for the eighth entry into the Texas Chain Saw Massacre franchise, another prequel that few asked for and premiered on DirecTV in the U.S. no less, the presence of acclaimed French directors Julien Maury and Alexandre Bustillo (Inside) does at least suggest the prospect of a boundary-pushing new effort that could take the series in a much-needed new direction. 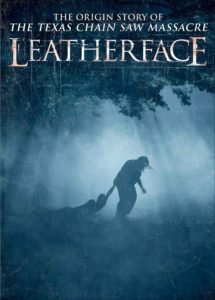 Unfortunately, Leatherface is deathly dull mulch for the most part, an initially intriguing whodunit that quickly blows its promise on forgettable death scenes, nothing characters and a flaccid shoulder shrug of a big reveal that registers so little interest you’ll probably be expecting another sting at the last minute (no, there isn’t one). After being removed from the custody of his mother Verna Sawyer (Lili Taylor), young Jed Sawyer is sent to an asylum for disturbed youths, and a decade later he escapes with a group of other inmates and a nurse they’ve kidnapped. The hook here is that Jed’s identity has been changed, and as such the audience goes most of the movie unaware which of the escaped mental patients will actually become the horror icon. It’s a fairly fresh and nifty idea for the subterranean standards of just about any horror prequel, though Seth M. Sherwood’s script unfortunately does little fun or interesting with it, and by the time Leatherface is finally born deep into act three, it’s hard to much care about how or why he got there. As bungled origin stories for Hannibal Lecter and Michael Myers have proven over the years, movie monsters are often more terrifying when their pathology is left ambiguous. It’s a shame the focal concept isn’t better-exploited, because this is an agreeably, almost handsomely grimy film at times, thanks to sharp shot selections and Antoine Sanier’s keen lensing. Furthermore, the film’s two most famous actors, Stephen Dorff and Lili Taylor, are trying (bless ’em), but they’re constantly at battle against both the plot’s general lack of intrigue and the cardboard-stiff nature of their characters. Dorff, a criminally under-appreciated actor who has undeservedly spent far too much of his career in the straight-to-video dungeon, displays all of the angry grit necessary to make his vengeful, bereaved Texas Ranger a compelling adversary to the Sawyers, but he’s mostly left to tread dramatic water. Meanwhile Taylor, a horror mainstay and snug fit for the role of the Sawyer’s twisted matriarch, is probably having the most fun out of anyone, but again, the script doesn’t give her enough to truly lean into the potentially gonzo quality of the part. Perhaps more disappointing than anything is the pronounced lack of chainsaw shenanigans. Yes, it’s a prequel, so it would be reasonable to expect less revving, chasing and slicing than your usual Texas Chain Saw joint, but even so, it’s mostly saved for act three, where the kills are neither inventive nor remotely memorable, and sometimes too comically over-the-top to be disturbing. Many forget, perhaps most of all this film’s directing duo, that the late Tobe Hooper’s classic 1974 original was incredibly light on gore, while here the screen is festooned with buckets of blood yet none of the visceral, hair-raising dread of the one that started it all. While devoted TCM fans will swallow down Leatherface out of loyalty, there’s little here suggesting the radical reinvention of the series one might’ve had distant hopes for. It’s certainly not the worst movie in the franchise if you’re seeking faint praise – can anything deign to out-awful 1994’s Renee Zellweger and Matthew McConaughey-starring TCM: The Next Generation? – but with a solid visual sensibility and two keen performers (the less said about Iron Fist himself, Finn Jones here, the better), this really should’ve been so, so much better. I’ve been watching Ed Gein movies for years. I’ll give this one a try too.